« Thank You for a Great Birthday–The Winner Are…. Are you constantly on the lookout for storage options for your clear and unmounted rubber stamps? Here at the Flourishes studio we’ve tried a range of products – some better than others. First we tried CD cases. These were easily available but had pitfalls from the start. The cases are flimsy and tend to break after prolonged opening and closing, however they are inexpensive so you can easily replace them. The bigger issue was size. We realized early on that larger stamps and stamp sets just won’t fit, or would be very crowded. Next we tried soft plastic boxes. This solved the size issue, but since the material was soft, it did not hold up well when you stacked them on top of each other. Material: The boxes are clear rigid plastic that hold up well. They are hinged so they open up and lay flat. Size: At 4 x 6 these hold our clear stamp sets perfectly. Flourishes stamps (and some of the other clear sets that are popular) come in 4 x 6 and 8 x 6 sizes. Two 4 x 6 sets fit in these – one on each side. Here is a photo of two 4 x 6 Christmas sets in one box. 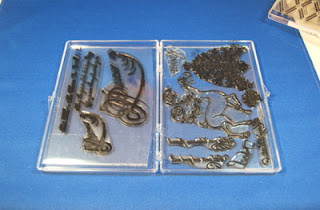 Here is a photo of an 8 x 6 set – Harlequin and Accessories – that fit in one box. For the larger 8 x 6 sets, just sort out your pieces and split half on one side and half on the other side. 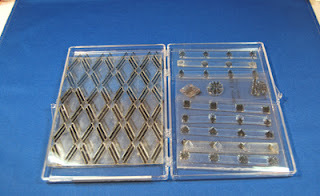 The depth of these boxes total ½” with ¼” on each side – a perfect depth for stamps! We used a label maker to attach labels to the boxes so that they can be found quickly. Because of their size, Flourishes background stamps Damask and Damask Reverse will not fit in these boxes. Flourishes is offering these boxes at six for $12 – enough to store 12 sets sized 4 x 6 or 6 sets sized 8 x 6. Please visit the Flourishes store and place your order today! These cases are great! I will have to get some for sure! What a FAB idea – those will work great for my TAC stamps too!